Former Democratic Rep. Dennis Kucinich said Monday that people shouldn’t be so quick to dismiss President Trump’s claim of being wiretapped. The reason? It happened to him. "I had a resolution in the House to try to stop the war and [Saif el-Islam Qaddafi, son of Libya’s former President Moammar Qaddafi and a high-ranking official in the country’s government] called me to talk about it," Kucinich said. "I cleared the discussion with House attorneys and a member of Congress is not supposed to be listened to by the executive branch," he added. "The Director of National Intelligence under President Obama was tracking my resolution and I didn't find out until two years after I had left Congress." “At the time I was leading efforts in the House to challenge the Obama administration’s war against Libya. The Qaddafi government reached out to me because its appeals to the White House and the State Department to forestall the escalating aggression had gone unanswered,” Kucinich wrote in column on FoxNews.com. He also said he doesn’t know if his call with the Libyan official was the only one recorded during his time in office. “I have never gone public with this story, but when I saw the derision with which President Trump’s claims were greeted—and notwithstanding our political differences—I felt I should share my experience,” he wrote. 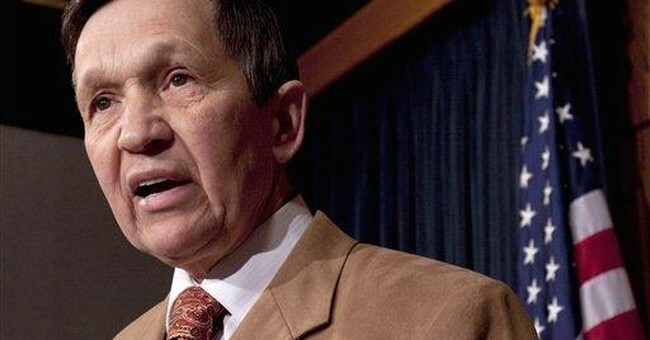 Kucinich served as a member of Congress for 16 years, serving Ohio’s 10th congressional district from 1997-2013.